Stunning and fit Actress #SunnyLeone is featured on the April issue of #WomenFitness and expressed her excitement on social media. Sunny Leone has created quite a niche for herself in Bollywood. The newly turned yummy mummy looked extremely fresh as she posed flashing her million dollar smile. She is sporting a blue spaghetti satin dress and wore no accessories along with it. 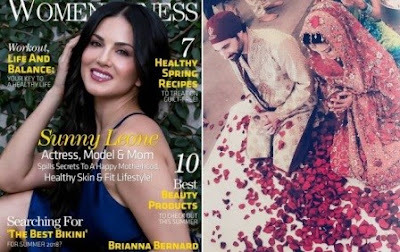 Along with sharing the cover, Sunny Leone also marks and celebrates her 7th wedding anniversary. The actress shared a picture with her husband, Daniel webber on social media from her wedding. Recently, Sunny Leone and husband Daniel Weber welcomed twins Noah and Asher earlier this month. The couple opted for surrogacy and Sunny had shared the happy news with her fans. On the work front, Sunny Leone was last seen in Tera Intezaar opposite Arbaaz Khan in a supernatural-romantic drama film directed by Raajeev Walia.